Got an event that you're going to, but don't know what to do with your hair? Need that party hair look? I've been busy with lots of Christmas parties this month and I was lucky enough to get my hair done at Hairco. Kinda wished that I knew about this place before my prom, could have gotten a better hairdo and pampering time here. Hairco ought to be rename to Hair-ven. haha. Get it? I felt like I died and went to heaven the moment I step into Hairco. I love their interior design and how posh the place was. They even served me wine, sparkling juice and freshly squeeze fruit juice. It was like I was at a spa. Plus their lighting make everything looks so picture worthy. You could instantly feel the Christmas cheer as you enter. 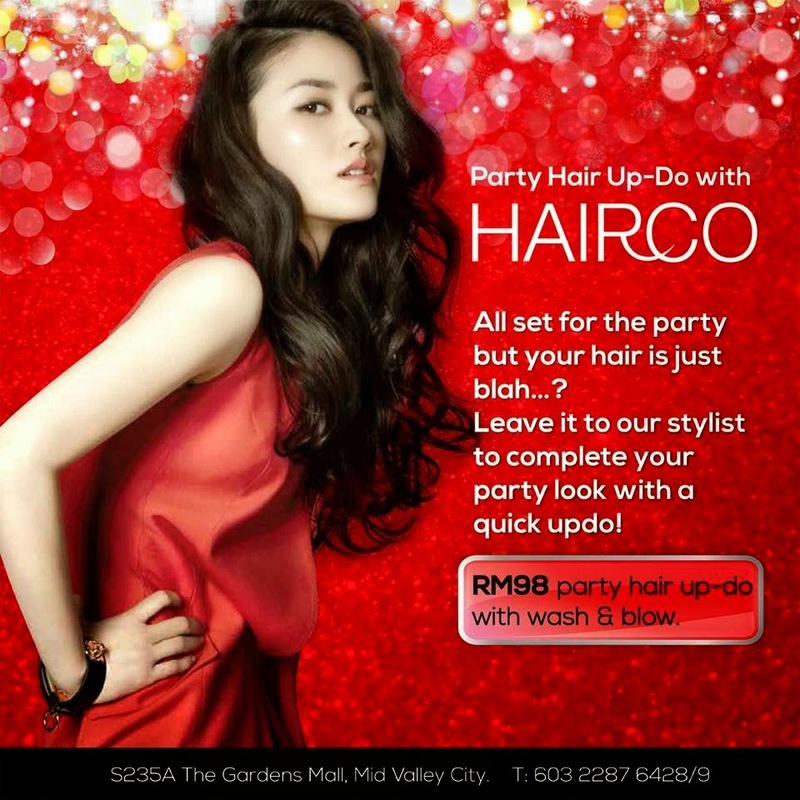 Hairco is currently having a promotion where you can wash, blow and get your Party Hairdo for only RM98! Talk about a wonderful deal. I was there last Thursday and got my hair done by Kenny. Since my hair was super duper long, he decided to give me a different look. One that I actually never thought I could pull off. Want to see more of what Hairco got to offer? Hairco uses all Shisedo products in their salon. I used the Aqua Intensive Range for my wash and got to experience the hairmask also. I notice that Shiseido Hair Products have a very cooling effect for the scalp and aromatic floral scent. Couldn't stop smelling my hair after the wash. haha. Compare to the salon I have been to, this environment/interior ought to be the best one I have ever been too. It's clean, it's polish, its decorated and best of all, I felt comfortable being there. For every customer that is there doing their hair, they are entitle to order what ever drinks you want! Everything is free of charge or you could say already included in your hair services. haha. I love their green tea because they don't just serve you green tea on your cup but it comes along with a cute zen tea pot. You could also order some wine if you feel like you need to relax. Or if you feel like you need a detox, you can choose apple or orange and they will blend your juice for you. My hairdo is a classic braid updo. 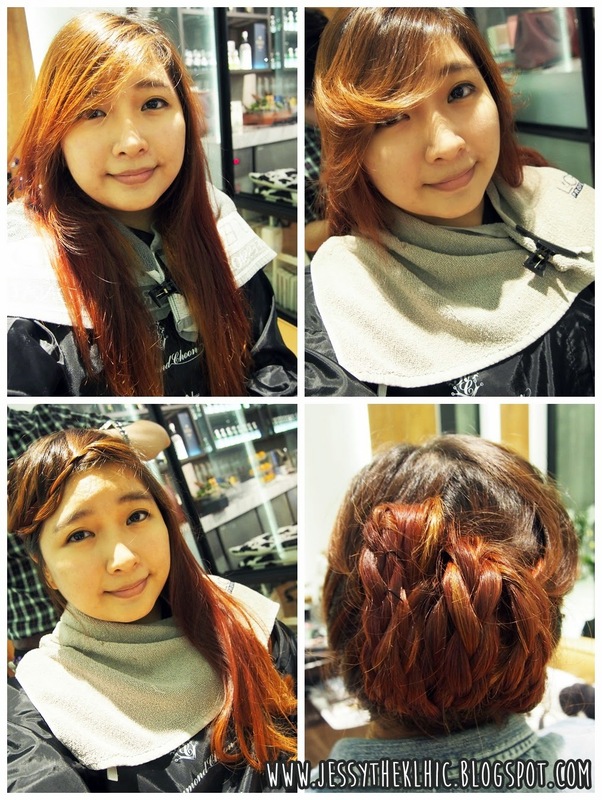 I guess my hair would be perfect for braiding because of the multi colours that would stand out from my hair. At every braid, you could actually see the different shades of colour I got from my previous dyes. I super love the fact that he braided my fringe also, since that visit, I been trying to braid my fringe also at every chance I get. Amelia and Jane was also at Hairco with me getting our hair done. It was a girls afternoon, I would seriously recommend you coming with your girlfriends. It's always more fun with company around you. But if you're worry about going alone to a hair salon, don't be for Hairco, all of the stylist there was super friendly and they would be super patient with your hair no matter how long or damage it is. haha. Trust me, my hair was really damage! After the hairdo, we got to listen to Raymond, the owner of Hairco, about our hair types and which hairdo would suit us. He even told us that one of the major attribute that damages to our hair is not the sun or dying it but rather the hair dryer we used. He said it's important to get a hairdryer that has he ion function or to really moisturize/treat our hair. I think you look great in that hairstyle. Lovely place to go to....the photos of the place looks cozy and great for a haircut. I love the idea of a privacy room....will probably check it out when I'm back to KL next week. LOVE THE HAIR! <3 I must go try them out. Hi pretty, just wondering do you have any more info about the Hairco Instyle?